Sea weed can be surprisingly tough and don't break easily, holding the ball together preventing it from breaking up. Worst, out can stick to your throat preventing the movement. 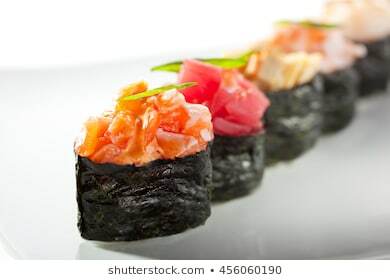 So if go eat sushi with small children, ALWAYS cut or remove the seaweed wrapping, children matt try to swallow..
aiyo.. Khiang jiu ho, mai kay khiang.. stuff the whole sushi ball into her limited space in the mouth is unwarranted..
come on, this is ridiculous. My kid eat sushi since 4 years old also never eat like that. Anyway this is not sushi it's an Onigiri, she crazy to stuff the whole thing. must have been practicing for her bf. By the way, this woman is dead after she choke on the onigiri. Edited by Mahjong74, 16 April 2019 - 01:41 AM. When the seaweed is dry, it tears crispy.. but when it's just a little be wet like in the photo below.. it sometimes stretches but don't break easily..
Edited by Playtime, 16 April 2019 - 09:17 AM. I think I read before, few people die from choking on onigiri every year in Japan. If u choke on food and no one is around, its easy to pass out. Sounds like a silly way to die but it happens. Sometimes it's cos u swallow too quickly as well the rice which is not moistened up enough, so it gets stuck. My late grandfather was at home alone, having fishball noodles. He choked on a fishball, was not found for at least 30-40 mins, did not pass away immediately though. He was in a coma for a few days before he died. I once almost choked cos I was in a rush and gobbled down some big lump of rice. Had to gag and try and regurgitate out. After that I got more careful to chew properly even if I'm in a rush. same for my late uncle who was early 90s then. he choked on a cut up fishball at home. family members tried to revive him but it was unsuccessful. as we age, our throat muscles weaken considerably and we can't handle the same food as when we are younger. so all of us should take note too. Onigiri (rice ball) .. Not sushi. Normally sushi are bite size.